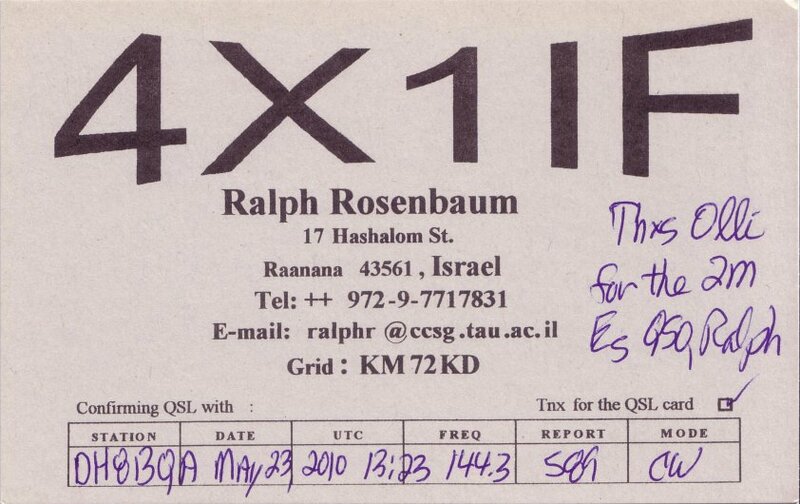 Just digging through the pile of QSLs received via the bureau last month and almost made a jump out of my chair. 😉 Finally received the card of Ralph, 4X1IF, whom I worked in May 2010 on 2 m via Sporadic E. That’s a whopping 2.863 km for terrestrial propagation, i.e. no EME or satellites! Remember the contact quite well as we were outside just starting to mount the recently bought Cushcraft X7 beam. I had to go inside to grab some wrenches when I heard a weak CW signal on 144.300 MHz. Couldn’t believe my ears when I identified 4X1IF calling CQ – Sporadic E + tropo extension over the Mediterranean Sea! Guys outside got angry waiting for me but cooled down quite soon after hearing what was going on and finally working their first 4X on 2 m as well. 😉 Nice ODX and and always nice to remember such once in a life-time occassions. Thanks a lot Ralph for replying to my card and supporting the bureau system. This entry was posted in DX, Propagation, QSLs, Sporadic E, VHF. Bookmark the permalink.